Use this diffuser ball to easily flavor soups and stews with fresh herbs and garlic. Infuse your cooking with rich, natural flavor with this infuser ball. 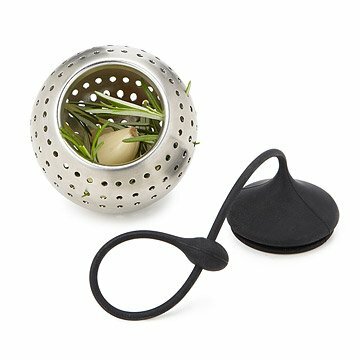 In the same way that a tea strainer floods hot water with flavor as it steeps, this infuser allows you to add aromatic herbs, garlic and more to your soups and stews without having to fish them back out of the broth. The ball is made from dishwasher-safe stainless steel. Its heat-resistant, silicone plug has a long, flexible tail that can hook your infuser to the side of your pot, making retrieval a snap. Made in China. Louise was on a mission to make her best Tom Kha soup yet, and enlisted the Soup Pot Flavor Infuser for assistance. See how her soup turned out on the blog. I wish this spice ball was larger but great quality gift. This will be used for soups and stews. It's a good size for a variety of herbs and eliminates the mess of a cheesecloth. Daughter had mentioned loving to make soup. This was perfect for her busy life. all who received have given great feedback, saying they love not having to 'fish out' bulk spices -- and the convenience of use and cleaning (stainless steel) -- plus, so much larger than tea holders or other smaller containers. Also, for chili, you can put hot peppers in, leave in the pot as long as you want or to suit the 'heat' you want, then easily remove -- control the intensity of your pot-o-yummies! The larger size makes it easy to add infused flavors to foods. It's much easier than my old tea infuser! I gave this as a gift to my sister & brother in law and they loved it. The gift was a big hit! This was a gift and was graciously received. Assume it works as advertised but not being a personal purchase, I have no input. Your catalog/website is great.